All contents of this blog are the property of Rose Marie Castonguay and cannot be reproduced in any way without prior written consent. I will make one exception and give consent for images on my blog to be pinned on Pinterest without asking me first. Please give me credit for any of my images. 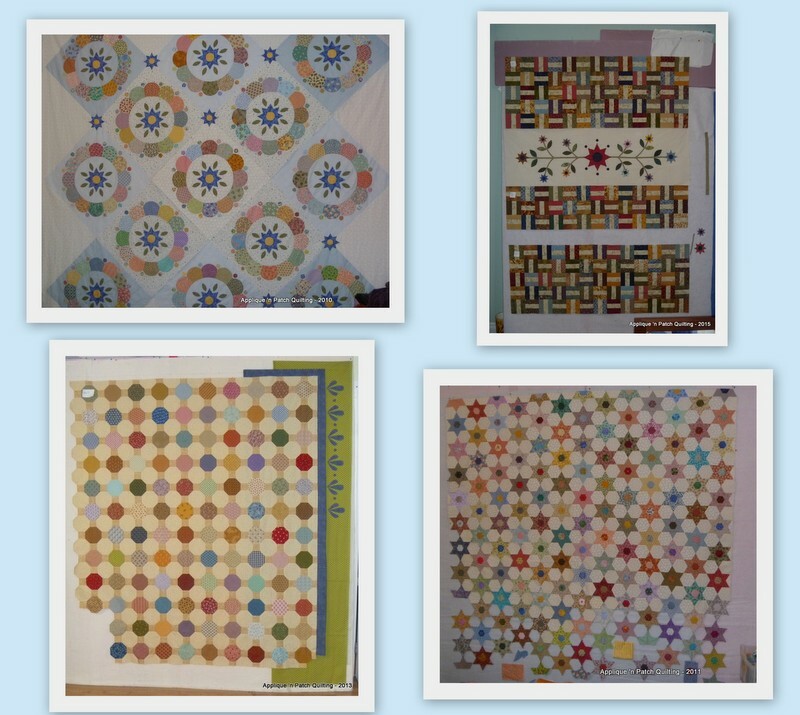 These quilts were finished during 2019. I do believe that I have entered into the realm of insanity. Why? How? What happened? At this time, I won't go into detail. Just give you a synopsis of the upcoming UFO's. Oh yes, some of these are long term and that is why I know they will become UFO's. LOL Let's face it, that is reality. So, to start off the list, here are Secret Quilt #1 and #2. These will be revealed in June of this year. I'm taking photos as I go and there will be lots to discuss at reveal time. Antique Sampler by Sue Daley. My Garage Girls friends Darlene and Claudia and no-blog Mary are joining me. Dutch Treat by Judy Garden. Meerkat Trading is holding this quilt-a-long and I'm using their shweshwe fabric which you can see behind the book. My friend, Debra of Patchwork Sanity and I are doing this quilt. We both saw this book at the Quilts by the Bay quilt show and we each bought the book. A Simple Life. Oh gosh, if only it was that simple. My friend no-blog Mary and I are doing this quilt. There is quite the story behind this quilt. More to come on that. How I got into this, I don't know? Reluctantly for sure. Anyway, this is supposed to be thread painting and I have until June to figure it out. Just after Christmas, there was a meeting in the garage and my friend Claudia asked me about the pact that we had made last January 2016. Oh, that pact. We had agreed to take 4 UFO's and finish them in 2016. Well ...... ummmmm .... here are the 4 that I had agreed on and guess what? Not a stitch was made. LOL LOL LOL So, I guess I had better do something with them this year. We'll see. Claudia did better. She finished hers. So, what are you going to do in 2017? Oh my goodness!!! You ARE going to be VERY busy this year!!! I hope we get some "visits" with the garage girls again too. ;) Looking forward to reading about all your progress. The "flair fiesta" pattern is a fun one. I have made the top and just have to quilt it. Maybe it will be one UFO for this year! They are all beautiful....so do these now trump all your other UFO's, haha. I will be looking forward to seeing the progress on each one. 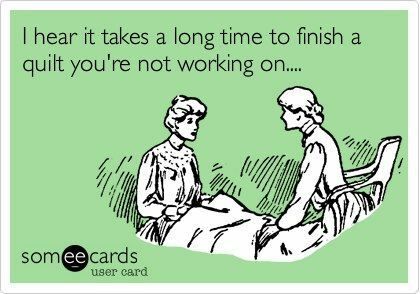 Well, I look forward to seeing how they progress......even if they don't ~quite~ get finished! I'm LOL right along with you! I've still got my three 2016 UFOs waiting from last year and I too, did not take one stitch on them in 2016. They are on my new 2017 list! 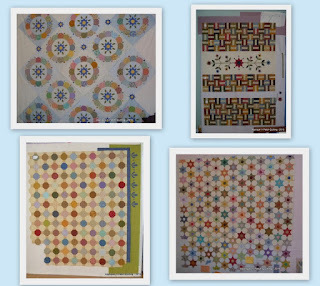 :)) I am going to enjoy seeing your progress on these gorgeous quilts - hopefully I'll get motivated watching you! I must admit Rose Marie, I read this post with a little trepidation...would I see another project to fall in love with when I already have my share. But whew no, all your new ones are already know to me with two on my list as well. I love that blue Dutch...how striking that would be with the white. But then all your quilts are beautiful. I hope your year is longer than mine. I can't imagine having enough time for even one of these projects!